I don't know about you, but I love easy weeknight meals. I'm not, however, the world's biggest fan of crock pots. They do a fine job of preparing winter meals with little fuss, but you will not see me signing up to eat 365 meals out of a crock pot. Why? Simple. I prefer flavor. All that said, there are several meals that I routinely prepare in the crock pot, including peppered pork and risotto. 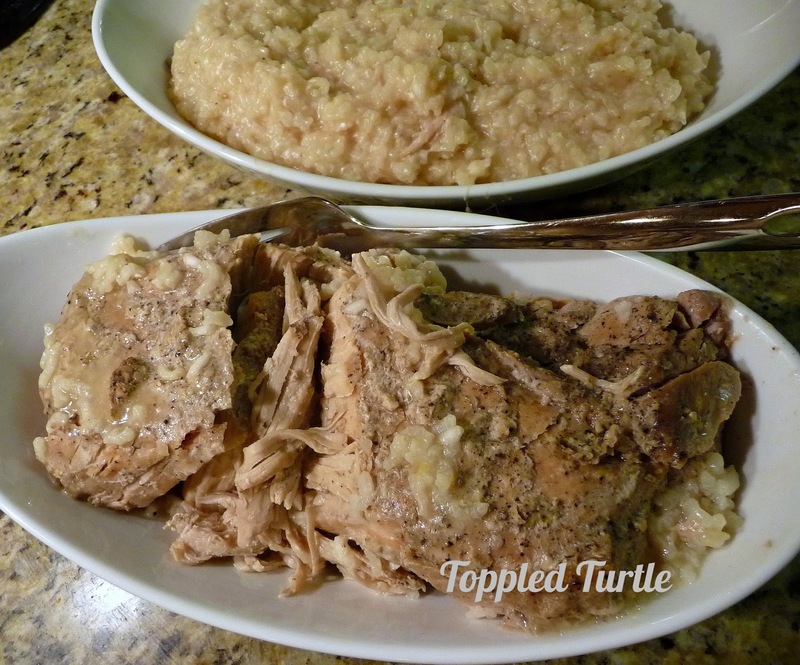 While its not the most colorful meal (let's be honest, most crock pot meals lack true color), it is a family favorite and perfect for a warming, comforting, home cooked meal on a busy evening. Step 1. Trim any excess fat off the loin. Step 2. Peel and dice or press the garlic. I use a press to minimize the amount of garlic smell on my hands, but if you like to dice it by hand, go for it! As far as jarred garlic goes - just say no. Really. Do not be tempted. Preparing the pork takes longer than any other step and really only takes about 10-15 minutes. 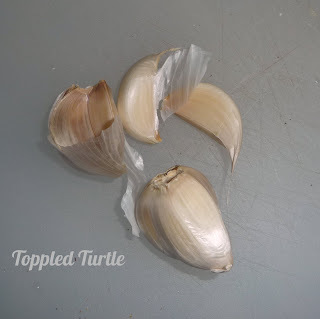 If you don't know how to easily peel the garlic, simply cut off the end, turn a large knife (like the one pictured above) so the blade is flat and lay it on top of the garlic. Use the heel of your hand to give it a good thwack - the garlic will separate easily from the skin! Now, the amount of garlic is entirely based on personal preference, but do keep in mind that crock pots mellow flavors so more is typically better. See the picture below for an idea of what is *left over* from an entire bulb. Step 3. Pepper. I prefer cracking the pepper and I use a lot of it - until my hands & arms are tired. 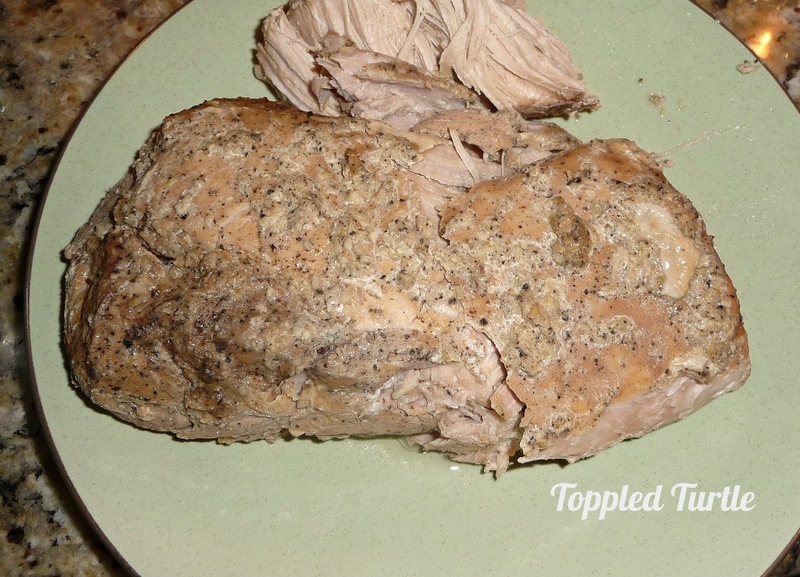 Again, a reminder that crock pots do a number on flavors. Step 4. Rub. Get your hands in there and rub down the loin with all that glorious garlic and pepper. Step 5. Flip the loin and repeat the garlic and pepper steps. Step 6. Add 1 entire carton of chicken broth (I use low sodium whenever possible) to the crock pot and then place the loin into the broth. I don't recommend putting the loin in first, unless you prefer to have all that garlic and pepper washed away when you pour in the broth. Step 7. 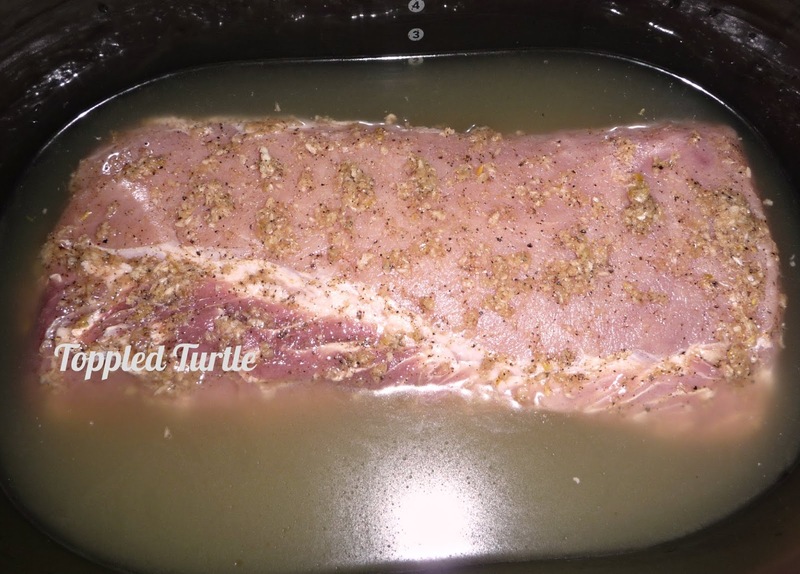 Cook on low for 6-8 hrs. Step 8. Remove the pork. It should be fully cooked at this point and don't be surprised if it starts to fall apart on you. Can you see how the individual rice grains are clearly visible? The problem with this scenario is that the rice on top (where the broth is no longer covering) will not cook as quickly as the rice underneath. Stirring it only results in mouthfuls of soft and firm rice all at once. Its not a good outcome, I assure you. Step 10. Cook the rice for 45-60 minutes. Here it is about halfway through cooking - see how the individual rice grains are starting to be harder to recognize? That's what you want! Step 11. 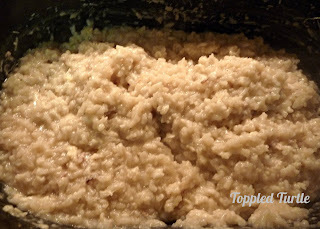 When the broth has been absorbed and the rice is porridge like, remove the loin and set aside. Stir in the parmesan cheese. Step 2. Peel and dice or press the garlic and rub onto the loin. Step 3. 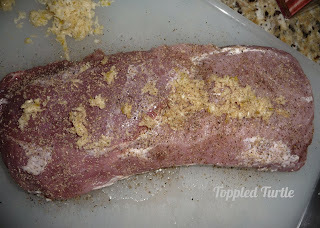 Crack fresh pepper all over the loin. Step 5. Flip the loin and repeat steps 2-4. Step 6. Add 1 entire carton of chicken broth to the crock pot and then place the loin into the broth. I don't recommend putting the loin in first, unless you prefer to have all that garlic and pepper washed away when you pour in the broth. Step 9. Add the box of Arborio rice and another carton of chicken broth. 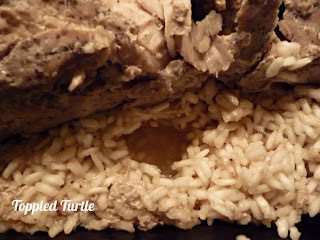 The rice should be fully submerged and then some. 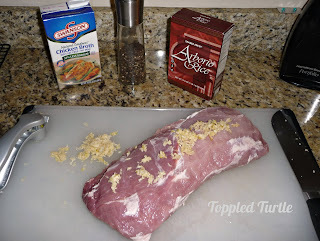 Then, add the loin on top. Step 10. Cook the rice for 45-60 minutes. Step 12. Serve & Enjoy! I can attest the this deliciousness, tried and true! Looks yummy! Can't wait to try it! You'll have to let me know what you think! 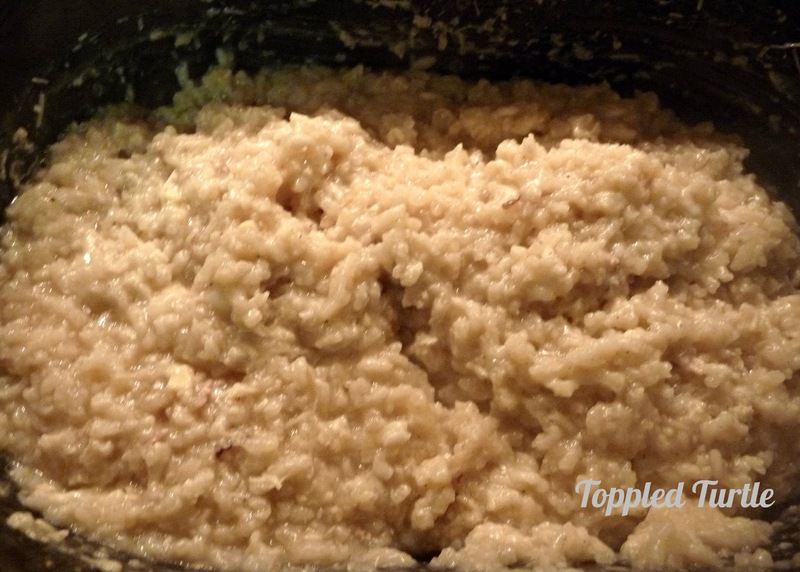 My sister, who is *not* a fan of rice has fallen in love with this recipe. In fact, she prefers the risotto to the pork! 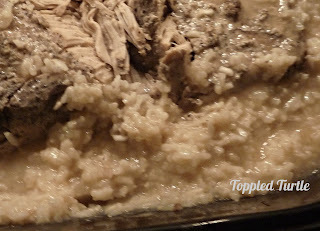 You can't have one without the other, however, because the seasonings from the pork help flavor the risotto. Hope you enjoy it!